Perfect Addition for Your "Chicken-Keeping Library"
Just by looking at the cover, it is almost impossible for "A Kid's Guide to Keeping Chickens" by Melissa Caughey to not catch your eye. Click on the picture to get your book now! Page after page after page is FILLED with all sorts of colorful pictures, funky designs, and informative material. The entire book is not "over-the-top" difficult to read and understand either, no crazy chicken terms thrown in there. And if there are, Melissa explains in detail what it means. Which was very helpful for me, because I am not a "chicken expert". I know the basics, but this book definitely made me feel so much more confident. 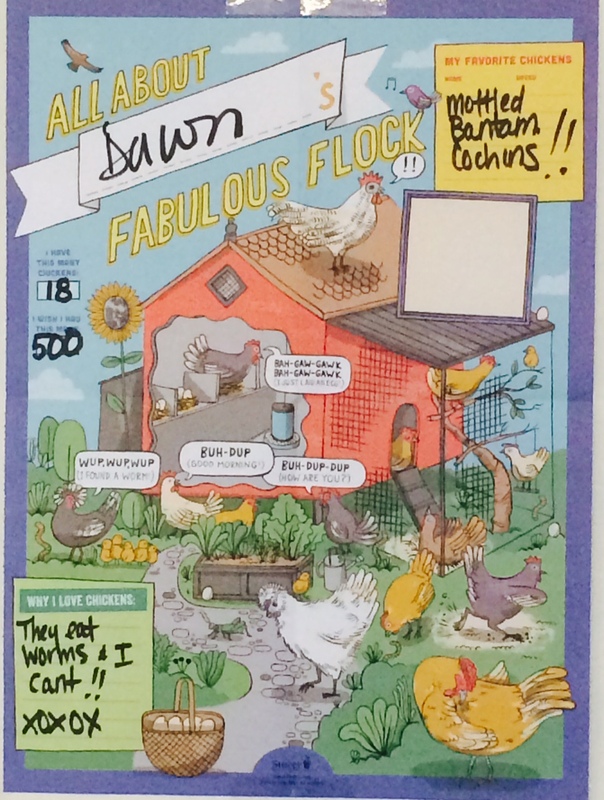 Which is why I say this next: although this book would be perfect for a child who is just stepping into the world of raising chickens, it is ideal for those who also want to become educated in every aspect involving how to care for your flock. This book covers the entire lifespan, from chick to hen/rooster, and what to expect during this beautiful, frustrating (at times), and amazing process. Not only does this book contain educational information, but also has tons of fun recipes, crafty ideas, interviews with chicken keepers, and even a poster at the end to fill out! This is my boss's poster. Pretty cute, huh? There was not one page that I did not enjoy. I found myself flipping through the pages so fast, that before I knew it, I reached the end! I genuinely felt the love and joy Melissa feels about chickens when she was writing this book. This was a great read, highly recommended, and I will definitely be reading it again. Thanks Melissa!